and save $200 per person. My wife Kathy and I have been to Europe six times in the past 10 years. For the past two years we have used Art du Voyage to set up our hotels, transfers and tours. What a difference they have made in our travel. Greeted the past two years by familiar faces and very friendly drivers and guides. Starting in Paris with Olivier at the airport and his wonderful tours, this year we had 13 family members and he accommodated our large group with anything we needed. We also were introduced to Antoinette this year in Paris, an Australian born woman who has been in Europe for a long time and in Paris for five or six years; she speaks fluent English and French, and is a great tour guide and fun person. Then on to Italy and the same warm treatment by the same familiar faces: The Splendido in Portofino and the Regina Elena in Santa Margherita, Le Agavi in Positano and greetings by Antonio in Amalfi. The great hotel selections and knowing exactly what our tastes are, placed Art du Voyage above any travel company we have ever used. We have heard nothing but great wonderful things about Art du Voyage from our travel agent, Mary Knaup, at Sunny Hills Travel and every driver and guide we met. They personally visit their guides, drivers, hotels and restaurants. Again, we cannot say enough about this company and will be using their services in Europe for years to come, and would highly recommend them to anyone who loves to travel and appreciates great service. Space is limited. Reserve today! "Quand le vin est tiré, il faut le boire"
In the 6th century, Germain, Bishop of Paris, was the owner of the estate of Gilly. In his honor, the Benedictine monks built a priory. In the Middle Ages, the Abbots of Cîteaux came to live there and fortified the Priory of Gilly. This precaution did not prevent several attacks and destruction during the Hundred Years' War. In the 16th century, Nicolas Boucherat II, 51st Abbot of Cîteaux, decided to rebuild the Château de Gilly and make it into a residential dwelling. 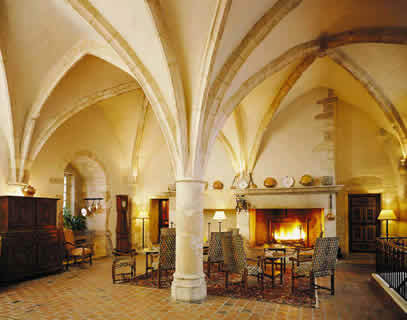 Château de Gilly stands in grandeur in the heart of Burgundy's Grands Crus between Dijon and Beaune. Indeed, its history and its presence are the very essence of the region. Its 14th century Cistercian origins contrast with the ornamental style of the 17th century to provide a palatial moated residence standing in formal "à la Française" gardens. The estate includes several buildings displaying centuries of superb craftsmanship. One such is the stone-vaulted cellar, now the restaurant, which is linked by tunnel to the main building. The cuisine and the wines are a gastronomic experience never to be forgotten - a worthy tribute to Burgundian culture. As one would expect, the hotel arranges a variety of cultural tours in the footsteps of St Vincent (patron saint of winemakers), but there are also many other colourful events that exploit the dramatic features of this fascinating property. Château de Gilly is part of "Grandes Etapes Françaises" and "Small Luxury Hotels of the World." The vineyard of Clos de Vougeot, founded in 1098, is the work of the Abbots of Cîteaux. Situated between Echézeaux and Musigny, it extends from the gentle slopes of the Côte to the plains. Today, it covers 100 acres. In the hands of Cîteaux for nearly 7 centuries, the vineyard of the Clos de Vougeot earned considerable fame which has made it, along with the vineyards of Chambertin, one of the most famous in Burgundy. Stay 2 nights and the third one is free!